This post continues the effort to understand various challenges children face navigating school. Fidgety Phillips and Phillipas are today’s topic, but first a picture. IMAGE BY Barnes and Noble. 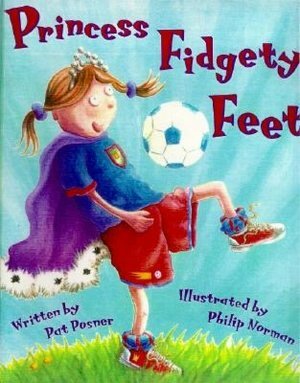 Story about how fidgety feet turned a princess into a soccer player. Sounds like a good one. And now a poem. This written in 1844 by Dr. Heinrich Hoffman. Fidgety people have been around since the beginning of human time. I am one. Philip is in sad disgrace . . . I like being on the move. Sitting quietly in church, in school, at work is hard work for me. I don’t like waiting turns. I interrupt when others are talking. I jiggle my legs, twist my hair, or tap my fingers or toes a lot. I like to do two or three things at the same time. I can listen to music or have the TV on and read or write at the same time. Ten down to five means you moved. Five means you wanted to move but didn’t although you had to work hard not to move. Four down to one means you had less and less of an urge to move. The higher your score the more likely some people think of you as Fidgety Phil. I score between a seven and eight. Fidgety people do not want to fidget, but sitting still is very hard for them. Fidgety people can sit still sometimes and that makes other people think they just fidget to be difficult. Usually fidgety people can sit still when they get a quick reward for sitting still. Video games calm some fidgety people. Fidgety people often can do two or three things successfully at once and that is a strength. Parenting tip one: Fidgetiness often runs in families. It is the way some brains work. It definitely runs in mine. Remember goodness of fit, that was talked about in an earlier post. Often one family member is fidgety and other members just the opposite. That is why figuring out every one’s temperament is useful. If you didn’t read that post, here it is Loves School/ Hates School. Parenting tip two: Goodness of fit also applies to society. When hunting was part every day life, the hyper-alertness of a fidgety person often served to alert others to the presence of game. Now that long hours are spent at school or on quiet jobs, fidgety people have a harder time. Meditating, but moving ever so slightly and rhythmically. Squeezing a stress ball when you need to be quiet. When at school or work, taking notes on what is being said. Using the Mind Mapping way to take notes is often a good skill for fidgety people to learn. Mind Mapping is a bit like doodling and doodling also is soothing, but bosses and teachers prefer mind mapping. Being allowed to color while listening. I allowed this in all my classes and workshops. In fact I provided adult coloring material and crayons. My only rule was that when I said pay attention, you had to put your crayons down for at least a minute. Parenting tip four: If fidgeting is interfering with work or school, medication may help. Too much ranting against medication means those that need it are not be helped. I never felt the need, but as the director of a child’s mental health service, I saw miraculous changes in behavior when some youngsters were medicated. One of the cashiers at my local supermarket has a severe case of fidgetiness. He readily admits medication saved his life and is giving one of his children a better shot at the good life. Parenting tip five: Seek out a competent child psychiatrist if medication seems indicated. Family doctors and even skilled pediatricians are no substitute for someone specifically trained to administer psycho-tropic drugs. If it going to be helpful, the difference is often noticed right away. If taking the medication makes things worse, it generally means something besides fidgety is the problem. Bi-polar and trauma disorders often react adversely to the medication used for fidgety problems. Habituation, meaning the body builds tolerance, and stronger doses might be needed as well as planned vacations from the medication. Parenting tip seven: Join an ADHD support group. CHADD is one of the best and they are on Facebooks. Parenting tip eight: Strengthen your self soothing skills. That is what Emotional Fitness is all about. Go here for a brief introduction to our 12 Daily Emotional Fitness Exercises. Of course, no man is entirely in his right mind at any time. Stay strong. Life is a struggle, full of pain and suffering. Parenting intensifies the struggle, but also brings joy to your life. Neither you nor your any of your children need to be perfect. Better to be good enough. Like, comment or share, so I will grow stronger. Thank you. Even the experts quarrel about what works best. Advice is advice, not a commandment. Read for what will help you and forget the rest. Forgive my errors for I have dysgraphia. if you need perfect posts, you will not find them here; I will understand if you don’t follow me. If you want to hang in with me, thank you. This entry was posted in Parenting Issues, Special Kids/Parents and tagged ADD, Challenged Children, dpchallenge, Fidgety, Getting along in school, parenting tips, Parents Are People Too, postaday, postaday11, Thinking about what matters. Bookmark the permalink.